September is transitional period in Vietnam, the temperature starts to drop to 27°C, although the amount of rainfall is still high, the chance of cancellation due to rain and typhoon is typically small. It is said that September is the perfect time to travel to Halong bay, the weather is nice and the sea water is ideally warm for swimming. September is the start of Autumn season with the average rainfall is 190mm which falls over an average of 14 days, comparing to the August, the average rainfall level of Halong Bay has dropped significantly and the frequency of typhoon is lower than that of August and July. The average temperature for this month is about 28oC and the peak temperature is 31oC while the lowest is about 24oC which is still very warm. Since the weather is warm and the rainfall level is low, you should be able to enjoy your stay in Halong bay, you should not forgot to bring along hat, umbrella, sunglass and sunscreen to prevent sunburn. While the weather is not as hot as previous months, warm and clear weather brings the out-of-this-world beauty of Halong bay. The temperature of the ocean is suitable for all cruise activities: swimming, kayaking and sunbathing. Traveling to Halong bay in September, you should keep in mind that at the early of the month there might be some small and infrequent storms but the rate of cancellation is relatively small. Toward the end of this month, the weather becomes more pleasant, the sunshine covers the whole bay with brilliant and warm glow. As the weather in September is much cooler than the summer time, you have more fun staying out door with less feeling of sweaty. Kayaking and swimming is must-do activities during your time in Halong bay and the weather make them more enjoyable for you. As it is mentioned, the clear sky is excellent for photography in the bay. Taking some of your time to visit floating village in Halong bay, it is a lifetime experience, you see how people live and children go to school it is truly worth your time. Other activities are available depending on type of cruises, you can enjoy the BBQ on the beach. Don’t be lazy when the nature is so nice to you. Get up early and join us for a Taichi section. Taichi is founded in China thousands years ago; nowadays, Taichi is practiced worldwide for both healthy and defending purpose. In our cruise, we introduce Taichi as a part of cultural diversity and as a reminder of exercising every day. The night sky in Halong bay during September is beautiful more than ever as it is about time of full moon festival. The sky was clear and the stars are sparkling, and you may wonder for how long have you missed that scenery? The romantic atmosphere of having dinner under the star or having a glass of cocktail will be the memory that you can forget. The last month of valuable offer – Get yours now! 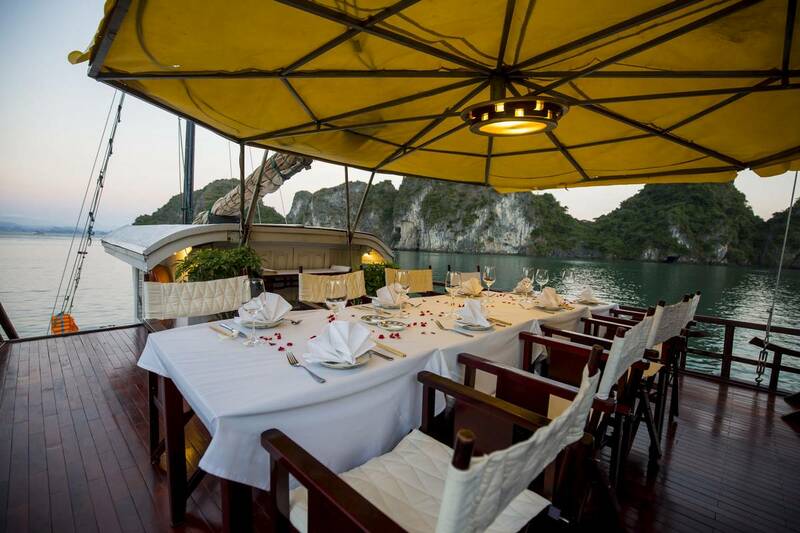 May to September, it is considered low season for travel on Halong bay so there are many good deal available during this season. September is the last month of the season, be quick and ask whether any promotion available when booking a tour in Halong Bay.